The Faroese Bird Migration Atlas describes the migration and movement of Faroese bird species based on ringed birds. 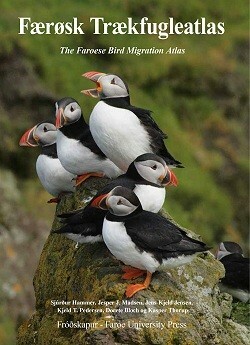 The starting point is the book, Faroese Bird Migration Atlas, published in 2014. On this website it is possible to be updated with the latest ringing data, incl. most recent recoveries. For all species recovered are described factors such as breeding area and winter quarters, migration phenology and direction, dispersal, mortality and causes of death - depending on the amount of data collected. On the website it is possible to get an overview of the current bird ringing material from the Faroe Islands. Faroese Bird Migration Atlas - both the website and the book – is prepared by the Natural History Museum in Copenhagen and Føroya Náttúrugripasavn and is made possible by favorable financial support from Aage V. Jensen Charity Foundation.